English Title on the line! 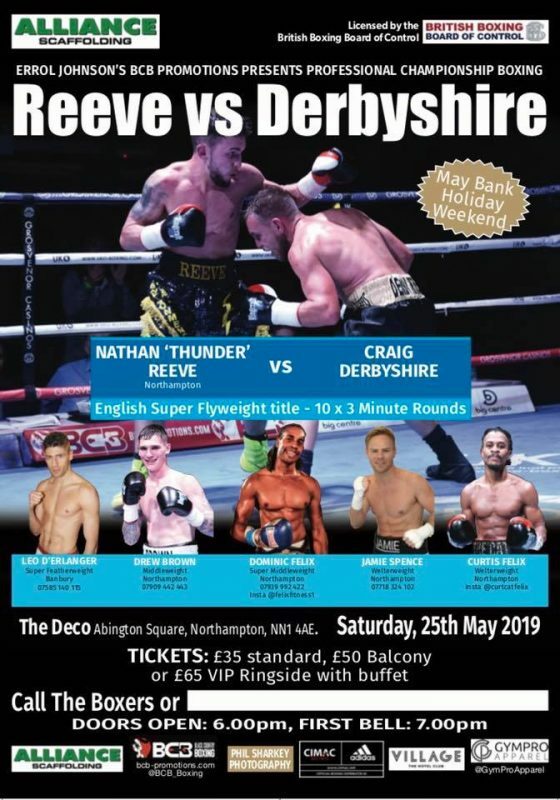 Northampton’s Nathan Reeve goes in search of English Title honours in his hometown next month. The 29 year-old steps up to super flyweight to challenge Central Area Bantamweight Champion, Craig Derbyshire, who steps down a weight division to challenge for national honours. The fight, promoted by BCB Promotions, takes place at The Deco Theatre, Northampton, on Saturday, 25h May. Reeve and Derbyshire have met before. Also at The Deco, Reeve came out on top with a points victory back in September 2017. “This is a massive fight for me,” Reeve told bcb-promotions.com. “I know all about Craig and he knows all about me. I lost against Louis Norman when I challenged for the English Flyweight Title and now, at the higher weight, I’m ready to right that wrong. Joining Reeve on the card are a host of fellow Northampton fighters. The Felix Brothers – Curtis and Dominic – are in action alongside Jamie Spence and Drew Brown. Banbury’s Leo D’Earlanger is also slated to appear. Tickets are £35 standard unreserved, £50 balcony and £65 VIP Ringside to include a buffet. They are available by contacting the boxer on social media or by calling 07725 098 499.